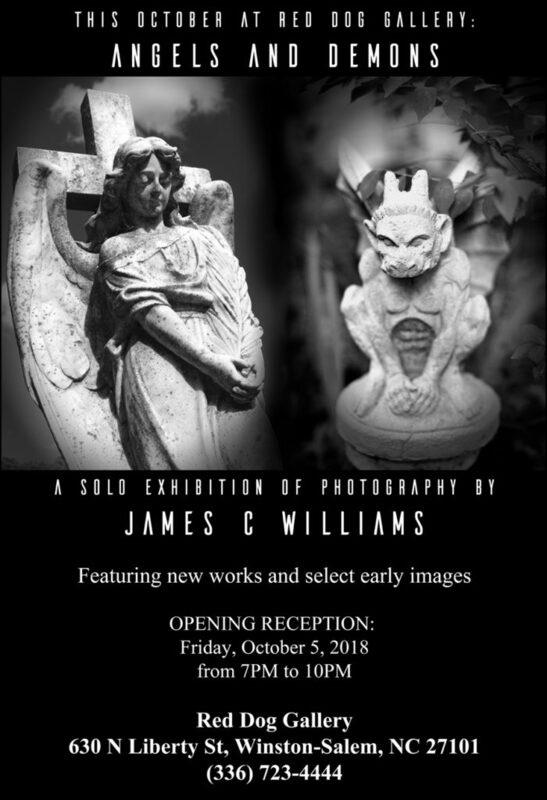 Drawing from photos he shot in England, Scotland, Wales, Puerto Rico and the Eastern US, James C. Williams presents a selection of cemetery angels, gargoyles, grotesques, and figures from medieval churches. Related landscapes are also included in the show. The exhibition, consisting of predominantly black and white works, features a variety of Williams’ signature infrared film photographs, as well as digital images in color, black and white and digital infrared. “One of my favorite locations to shoot in is cemeteries, and one of my favorite subjects is angels. I am also drawn to medieval gothic church adornments such as gargoyles or grotesques, which are my demons. This is the exhibit I have wanted to show for years and I feel these bold images push beyond the dominant norm, elevating the subject matter beyond Goth”, says Williams. During the reception, the photographer will give a gallery talk at 8 PM about his work and the stories behind certain pieces. The exhibit will be on display through October 26th. Red Dog allery is open Tuesday through Friday from 11 AM to 6 PM, and on Saturdays from 11 AM until 4 PM. 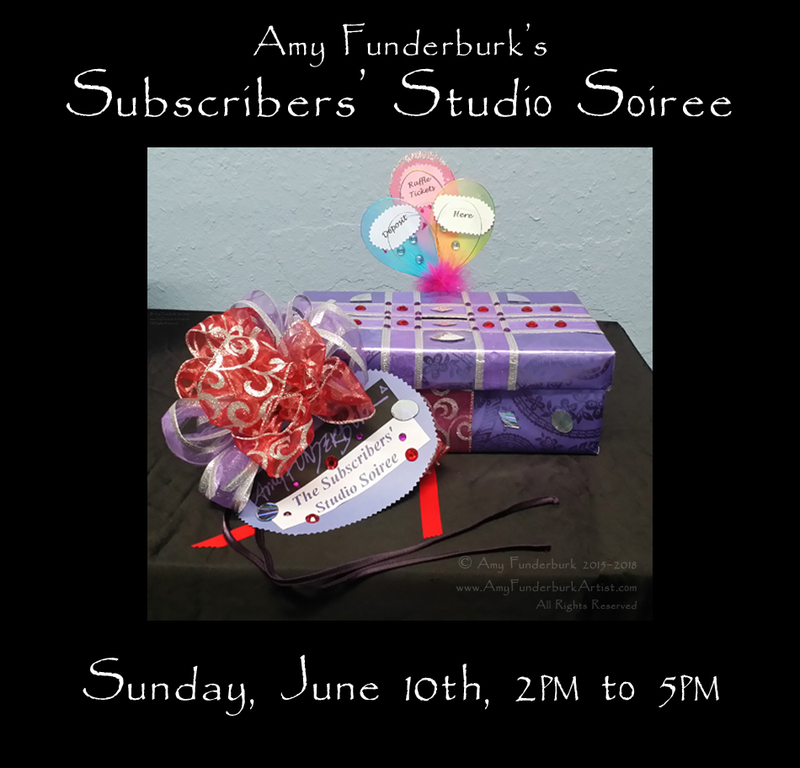 The 2018 Subscribers’ Studio Soirée was held June 10th. Many thanks to all those who attended! Stay tuned for an update on this year’s event! In the meantime, here’s a taste of what you missed…. Please plan to join us for this very special annual event held exclusively for newsletter subscribers. Attend and you might win one of our fabulous raffle prizes! This year our special guest will be Andrea Amanpreet, who will treat us to the ethereal, healing sounds of her gong. Please read on for complete information on all the special Soirée events. Please RSVP by Wednesday, June 6th; you don’t want to miss this! New Work. As an extra incentive for you to attend, other than what you see here, I won’t be giving out any additional sneak peeks of my new artwork or works in progress until after the Soirée, so come have a look in person! 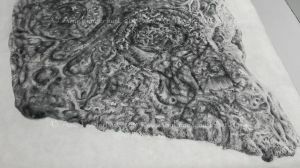 Get ready to view the charcoal rubbing drawing Fictitious Pictish Standing Stone, my life-sized rendition (and symbolic self-portrait) of the Aberlemno Serpent Stone, a prehistoric standing stone later carved by the Scottish Picts with their mysterious symbols. The Magic of Color. For this year’s special art event, periodically throughout the afternoon I will be sharing some “visual games” based on color theory as well as the physiological effects of color that are sure to amaze and delight you. Labyrinths. Attendees will also have the chance to participate in the final two works in my series of interactive, meditative labyrinth drawings. 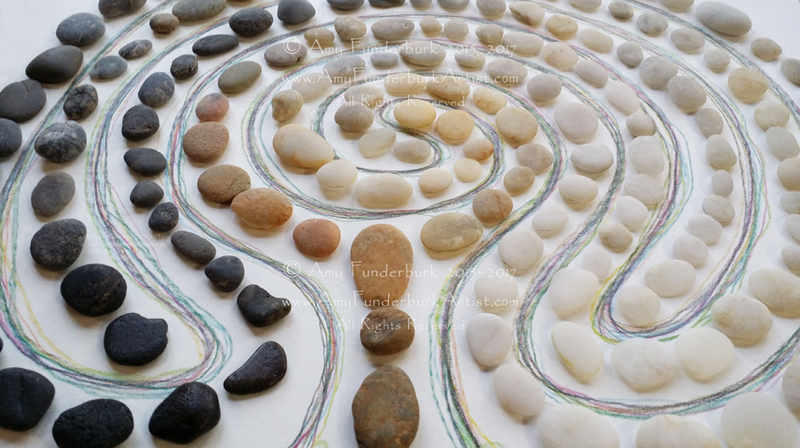 After participants add their additional layers among the template stones of The Continuous Labyrinth, I will ultimately base the final stage of this piece on the element of earth. We will begin the fourth and final work in this series during the Soirée, inspired by the element of air. Studies have shown that you achieve the same sense of calm in your mind by tracing a labyrinth design with a pencil as you gain when physically walking one of these ancient patterns, so come trace the labyrinth to feel centered and relaxed! 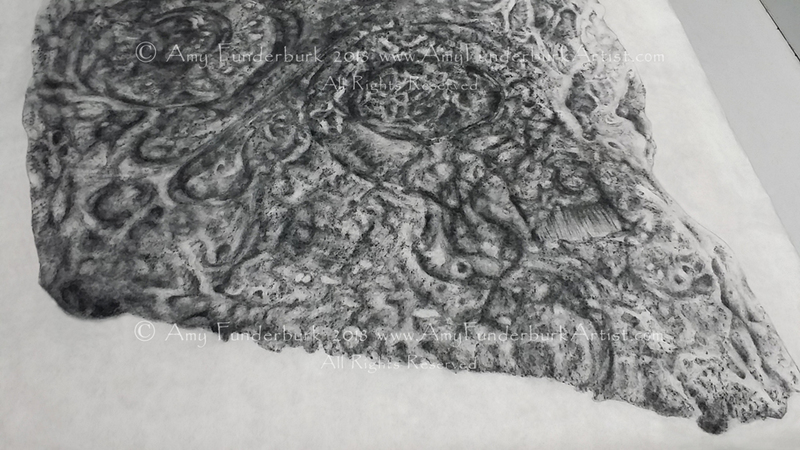 Click here to see how I developed the first work in the series, Blue Moon Fire Spiral, from its linear beginnings as a communal labyrinth. Get ready to experience something really extraordinary at this year’s Soirée, thanks to our special guest, Andrea Amanpreet. Trained in the traditional practices brought to the West by Yogi Bhajan, Kundalini Yoga Teacher and Sacred Gong Player Andrea Amanpreet will present Sacred Sound Gong Meditations. Andrea’s meditative, ethereal playing can really transport you. You must experience the powerful fullness of her performance in person! 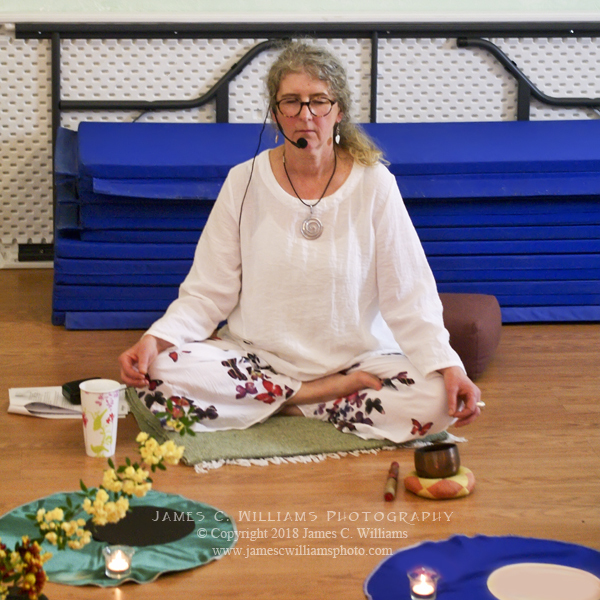 Andrea Amanpreet has taught Kundalini Yoga and offered Sacred Sound Gong Baths in Winston-Salem for the past four years. She loves sharing these ancient technologies with those seeking to travel inward, helping them to connect with their soul purpose and to raise awareness with which to experience life more fully. To learn more about Andrea and the services she provides, please visit her website. Tickets. All newsletter subscribers who come to the Soirée will receive one raffle ticket just for attending. If you bring guests, you’ll be awarded a bonus raffle ticket for each one who subscribes during the Soirée! As an additional reward to my subscriber patrons, you can earn additional raffle tickets by making a minimum $25 purchase or more between now and during the Soirée. Clients who attend this year’s Soirée who have made purchases since last year’s event will also be awarded additional raffle tickets. Earn a raffle ticket for every $25 spent, and increase your odds of hopefully winning a prize when attending the Soirée! Please visit my Shopping Cart page to see available merchandise at a variety of price points. Please note that you or your representative do need to be present to win; the raffle will take place at 4 PM. • Expand Your Horizons. A two-hour art lesson, critique, creativity coaching session, or art career consultation with yours truly at my studio – for you or the artist in your life. Non-artists, consider the benefits of unlocking your creative potential, because lateral thinking is a vital asset to problem solving in any career. Or, if you prefer, an introduction to color theory is just as applicable to home and garden choices as it is on the canvas. A $70 value! For more information about the range of topics I cover, please visit my Workshops and Private Instruction page. • Connect in style. 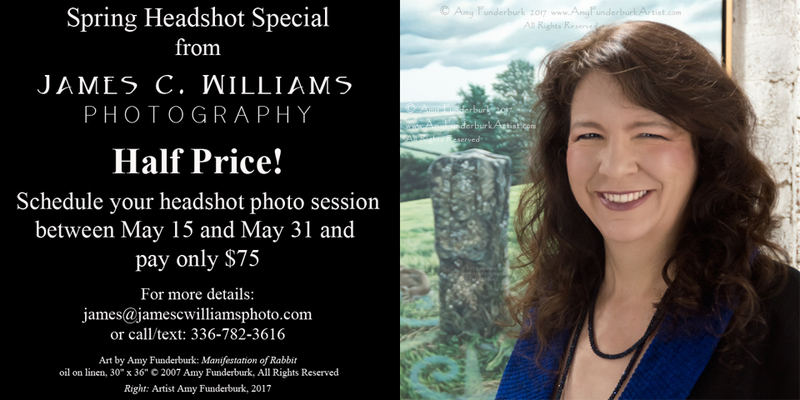 The winner will receive one photography session for a promotional head shot of one model by photographer James C. Williams. During this session, Jimmy will produce between three to five images for you to use as you wish — perfect for your PR needs, social media, or other personal use. A $150 value! Jimmy has been a photographer for 14 years, and is available to provide for all of your photographic needs. While you may know him for his fine art landscapes, Jimmy is also a very skilled portrait photographer. You need look no further than my own PR photograph below to see Jimmy’s head shot work, but please visit his website to see more. • A stunning, handblown glass oil lamp from my good West End Mill Works neighbor, The Olio, a non-profit Glassblowing Studio and Social Enterprise focused on community, arts, empowerment, and sustainability. The Olio offers programs for all ages, including classes, workshops, a Youth Apprentice Program, and a retail shop. A uniquely sustainable studio, the Olio recycles and repurposes waste bottles into handblown glassware. 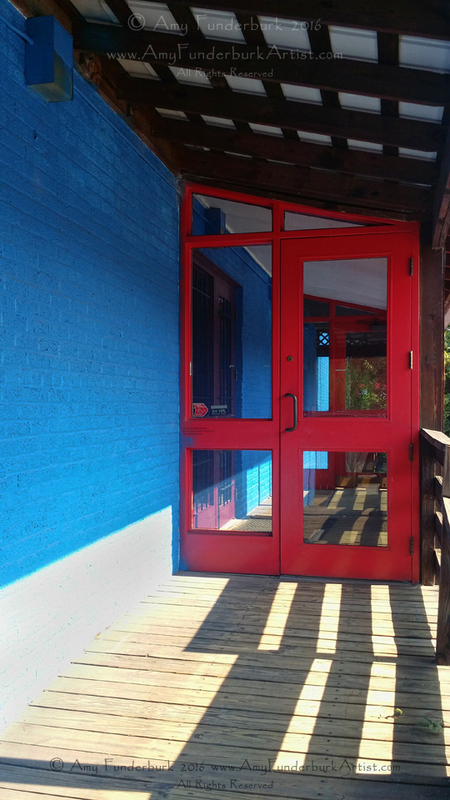 Studio 111 is located in the cobalt blue building in the historic West End Mill Works Community at 915 Bridge Street, Winston-Salem, NC, 27101. Bridge Street is off of Northwest Boulevard, between Reynolda Road and Thurmond/Broad Streets. (Thurmond changes into Broad at that intersection.) Once you turn off of Northwest Boulevard onto Bridge Street, you’ll pass The Breathing Room yoga studio, The Olio Glassblowing Studio, and The Porch Kitchen and Cantina. My building is beside The Porch, on the other side of the archway and greenspace connector, on the corner of Bridge Street and Canal. Click on the link above to open a map. 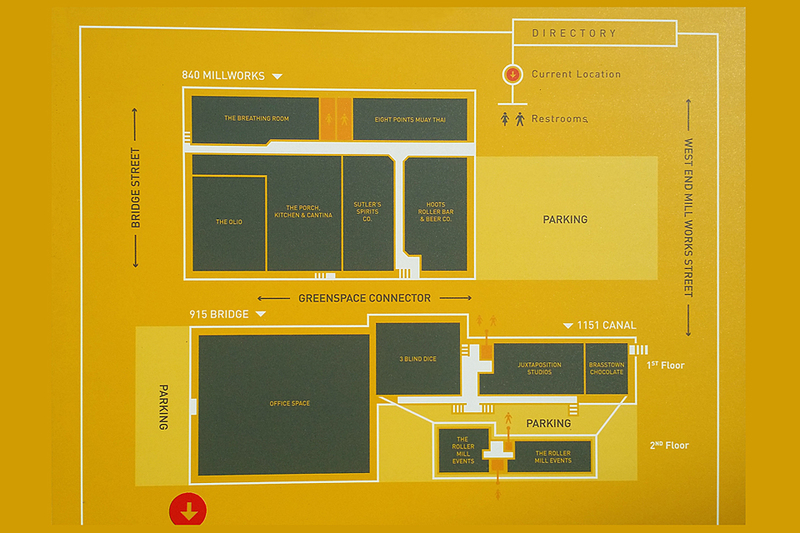 Please also refer to the yellow map of the community pictured above that you will also find posted around the area — my building is labeled Office Space (the largest gray rectangle in the lower left of the map). If Northwest Boulevard was shown on this map, it would run left to right along the top. Parking is available in front of my building as well as along the side, as shown on the map. Look for the cobalt blue building with dark red trim pictured below — it’s the only building painted these colors in the community. My signage and balloons will also let you know that you’ve arrived! Accessibility. There are two doors that lead directly to the front door and lobby area of my building, as seen in the photo above. A ramp, visible in the photo of the red door, is located on the side closest to the greenspace connector garden and The Porch. My studio is located on this floor. We look forward to seeing you at the Soirée! Please subscribe to my newsletter Off the Easel to receive announcements of future events, and to receive an invitation to my annual Spring Subscribers’ Studio Soirée, a special event open exclusively to newsletter subscribers. Please check the Workshops and Private Instruction page for information about current and upcoming art workshops and seminars.